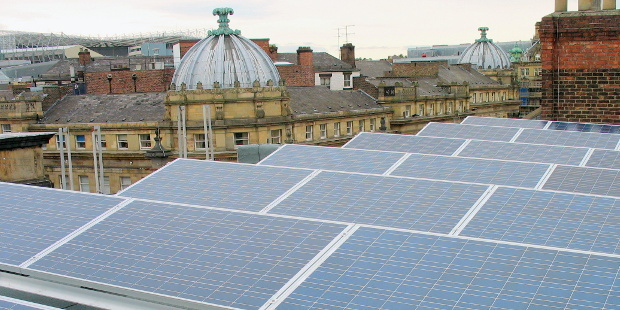 Narec Distributed Energy was commissioned by the Newcastle Theatre Royal Trust Ltd. to undertake the design and project management of a renewable energy installation on the prestigious Grade 2 Listed Theatre Royal in central Newcastle. The client was keen to reduce their carbon footprint and energy costs and took the opportunity of a major structural refurbishment project to engage Narec Distributed Energy to investigate the possibility of on-site renewable energy. Narec Distributed Energy discussed in detail the refurbishment plans and the client’s needs from the system. Several technologies were considered and a roof-top photovoltaic array was selected by the client. On completion of a feasibility study which included detailed financial modelling, a system proposal was offered for the client’s architects and building contractors’ consideration. Narec Distributed Energy worked with the architect to design a PV array which satisfied the technical and regulatory constraints whilst maximising the potential for CO2 savings and revenue generation. Due to the Grade 2 Listed status of the building, it was essential that no part of the PV array would be visible from the ground level. Narec Distributed Energy developed a 3D CAD model to ensure this would be achieved. English Heritage and the planning officer validated the design with a line of sight survey before planning permission could be granted. The model was also used to demonstrate that the array would not be shaded at any time. Narec Distributed Energy assisted the client with the selection process for the appointment of a suitable installation contractor. Following the installation, Narec Distributed Energy inspected the work to ensure it had been carried out to the appropriate standard and that the system had been correctly commissioned. Narec Distributed Energy project managed the installation of a large PV array on a listed building from concept through to commissioning. In addition, Narec provided renewable energy feasibility, costing and system design services to the project.